The Governor's Mansion, located at 200 North Blount Street in Raleigh, is the official residence of the governor of North Carolina. It is the third structure in Raleigh to serve in that capacity since the city's designation as the state capital. The first, a two-story frame house located at the corner of Fayetteville and Hargett Streets, was initially provided to the governor in 1797. It proved inadequate, and in 1816 an elaborate brick structure with white-columned porticoes was built. Known as the Governor's Palace, it stood at the end of Fayetteville Street, facing the old statehouse. North Carolina governors used it until 1865. From 1865 until 1891, the state's chief executive was responsible for securing his own accommodations while in Raleigh. Most governors rented private homes or stayed at the Yarborough House on Fayetteville Street. Although a state commission in 1879 had investigated building a new residence, the General Assembly did not authorize construction of the house to be located on Burke Square until 1883. Samuel Sloan and assistant Adolphus Gustavus Bauer of Philadelphia were selected as architects. Construction began in the summer of 1883, with extensive use of convict labor from the nearby penitentiary. Bricks and other building materials were also provided by the prison. Sloan died in 1885 before the house was completed, and Bauer assumed direction of the project. Col. William J. Hicks, warden of the prison, supervised construction work. 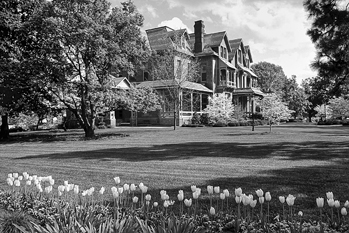 The Executive Mansion, which is the official name of the house, was completed in 1891. Governor Daniel Fowle moved in on 5 January of that year. The state's chief executives and their families have lived there continuously ever since, except during brief periods when renovations have been undertaken. The house, considered an outstanding example of the Queen Anne Cottage style of Victorian architecture, is noted for its many turrets, bays, and towers, steeply pitched gables, colored textural surfaces, and elaborately turned woodwork. It is open to the public by appointment. William Bushong, North Carolina's Executive Mansion: The First Hundred Years (1991). North Carolina Department of Cultural Resources, The Executive Mansion, Raleigh, North Carolina (5th ed., 1985). "State Capitol: North Carolina Executive Mansion," North Carolina Historic Sites. http://www.nchistoricsites.org/capitol/exec/exectour.htm. "North Carolina Executive Mansion," National Park Service. http://www.nps.gov/nr/travel/raleigh/exe.htm. "Executive Mansion," North Carolina Highway Historical Markers Program. http://www.ncmarkers.com/Markers.aspx?sp=Markers&k=Markers&sv=H-117. The Governor's Mansion in Raleigh. Photograph courtesy of North Carolina Division of Tourism, Film, and Sports Development. 1 January 2006 | Anthony, Robert G., Jr.
i am doing a report on this and it will sure come in handy!! !